Axxis Corporation produces parts used in the energy, aerospace, automotive aftermarket and medical device markets. The Perris, Calif., shop wanted to improve flexibility and labor efficiencies to drive down part costs for its customers. The company was looking for new equipment. It needed the kind of technology that would enable it to reduce setups by consolidating operations and give it the flexibility to expand into other part materials and quantities as it grew its operation. Axxis aimed to stand out from its competition through greater speed, reliability and quality. Personnel at Axxis first considered a high-performance horizontal machining center to help the company consolidate operations. But upon witnessing the capabilities of an automated horizontal machining cell with pallet-handling system, the company reconsidered its plans. Realizing the potential that eliminating repeat setups could bring, Axxis invested in a Makino a61nx horizontal machining center with a 12-pallet MMC2 automated machining cell. This decision was made not only because of the equipment’s capabilities but also the immediate response from SST, its local Makino distributor. Axxis wanted a vendor that would provide support long after the sale. 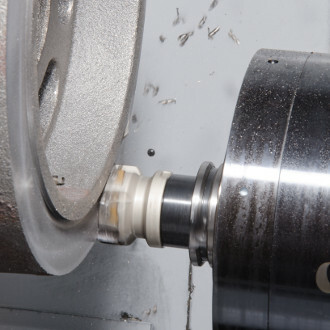 The time that the SST representative took to show Axxis how an automated machining cell could help the business grow made a big impression and influenced the decision. Company personnel also attended training at Makino’s Mason, Ohio, facility prior to installation of the automated horizontal machining cell. Even after only a few months of running the new system, Axxis is experiencing positive results. It has achieved four times the production speed while tripling tool life, compared to its previous equipment. Axxis has achieved the flexibility it was seeking. When the company has a repeat order or one-off part to produce, it no longer needs to spend as much time in setup. It can just recall the job and run it. Cycle times have been cut in half, thanks to improved speeds and feeds. With the machine’s rigidity, there are no issues with quality. Accuracy has improved as well. In fact, the company is maintaining tolerances of plus or minus 0.0005 inch. Customer service has also improved. Because of the machine’s data collection, Axxis can look ahead and anticipate any bottlenecks, helping it cut lead-times in half. The company has gained new customers as it expands into new markets.